Pullman moved his family from Albion, New York to Chicago in 1865. He married Harriett Sanger, daughter of a construction company owner, on June 13, 1867. Together, they had four children: Florence (1868-1937), Harriett (1869-1956), and the twins George, Jr. (1875-1901) and Walter Sanger [known as Sanger] (1875-1905). A young man named Gustave Behring claimed that he was the illegitimate son of Pullman. Florence was his acknowledged favorite, accompanying him on many business trips. Harriett lived the longest, until 87, and had several marriages. The twins were a source of great scandal and heartache, described partially below. Florence was Pullman's favorite child, and, in fact, she seemed to be his favorite relative. She often accompanied him on business trips and served as an advisor to him. She was quite an eligible marriage prospect, and had a number of marriage proposals. After rejecting several suitors, she married a young lawyer named Frank Lowden. 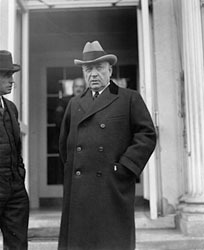 Lowden eventually became Governor of Illinois from 1917 to 1921. He was a candidate for the Republican nomination for president in 1920 and 1928. She was active in charity work and the social scene in Illinois. She had 4 children, Pullman Lowden, Florence Lowden, Harriett Lowden, and Frances. Florence died peacefully in her sleep at her farm in Oregon, Illinois. Harriett, like her sister, lived a relatively peaceful and happy life. She was married and widowed twice; she had no children. Her first marriage was to a prominent San Francisco man, Frank J. Carolan. Most famously, the Carolans built the Carolands estate in Hillsborough, California. The Carolan marriage became embittered over quarrels concerning the building. In 1917, the Carolans separated and moved out of the Chateau; Harriett moved to the East Coast, Frank remained in California. After Frank's death in 1923, Harriett married Colonel Arthur Schermerhorn in 1925, and although the new couple briefly reinhabited the Chateau in 1927, it would remain essentially uninhabited for its first 29 years. As alluded to, the twins were a source of great scandal and heartache. George, Jr. in particular led a life that could charitably be described as spirited, being named in several romantic scandals and at least one divorce proceeding. George Pullman's will clearly reflects his feelings towards his children: his wife and his daughters got the vast majority of the estate, while his sons were left with little.